Thanos #16 Review – AiPT! Donny Cates tells the origin of Cosmic Ghost Rider and it is amazing! Let me start out by saying that I haven’t been keeping up with Thanos. My colleague David Brooke has done a wonderful job reviewing the series lately. But Dave B. has also been sending me messages telling me that I need to read Thanos because I’m missing out on Cosmic Ghost Rider! I love Ghost Rider. He is one of my favorites. Thanos #15 revealed who the Cosmic Ghost Rider was — this isn’t spoilers by now, you should know this — he’s another favorite of mine, Frank Castle, The Punisher! Say what? Okay, I had a really hard time swallowing that one, just ask Brooke. Cosmic Ghost Rider didn’t sound like Castle, he sounded more like Deadpool. But, I was willing to see how this played out. So, when David offered up Thanos #16, the origin of Cosmic Ghost Rider, for me to review — I couldn’t pass it up. So Dave, is it everything you imagined? Thanos #16 didn’t disappoint. As I said, I had my doubts seeing Cosmic Ghost Rider claim that he was really Frank Castle. Geoff Shaw and Antonio Fabela kick off the story with an outstanding page displaying an older Frank Castle, guns blazing during the final war between Thanos and the Earth’s heroes. Cates provides the narration explaining Castle’s past and that he was one of the final heroes standing. But Castle was finally defeated and as he lay dying, his final words were, “I would give anything to punish that purple sonofabitch.” As luck would have it, or maybe not luck, his words were heard by Mephisto. So Castle strikes a deal with one of three devils he will encounter on his journey. He becomes Ghost Rider, Spirit of Vengeance. Hats off once again to Shaw and Fabela. I didn’t think seeing Ghost Rider donning the iconic skull shirt would be a justifiable look but I was wrong. Castle racing across the scorched Earth on his motorcycle equipped with an obscene gatling gun is truly a sight to behold. Castle soon crosses paths with the second devil, who alters his appearance once more. I’ve told you enough, you are going to have to run out and get the book at this point. Because there is also still the third devil that I am not going to hint at. AND there is another appearance from another one of my favorite characters! I gush, but it was awesome for me to see three of my favorites in the same book. The best part is that it all clicked. Wait until you see the final page! Dave, we know it’s good! You’re damn right it is good. Writer Donny Cates is the real reason I decided to see where the Cosmic Ghost Rider/Frank Castle experiment was heading. There are few writers that I believe could pull this off and luckily for me, Cates is one of them. Reading Thanos #16 also had me questioning why I didn’t start this series from the beginning. A puzzle that will soon be solved as I intend to track down all the past issues. Frank Castle becoming the Spirit of Vengeance just works. It makes sense. He has always had a thirst for vengeance and now he has been upgraded. Cates does an exceptional job telling this origin story. Castle loses his mind as there is no one left on Earth. He travels the empty wasteland with no real destination in mind. Just doomed to repeat an endless journey, or so we think. Cates makes you feel that feeling of despair and you feel sorry for Castle. The man will never have peace. Shaw and Fabela kill it this issue. Shaw’s artwork is excellent from the start and vibes well with Cates’ script. Fabela’s colors add to an already dark and grim atmosphere that the Rider ventures through. From the opening page to the final shocking page this issue is gorgeous. The pair capture the essence of both Castle and Ghost Rider. There are so many reasons for me to recommend the is book. If you are a fan of Ghost Rider or Punisher, this is a no-brainer to pick up. Obviously, I don’t know the whole story as this is where I am jumping on but Thanos #16 makes me want to go back and start at the beginning. Bottom line, this book is outstanding and very entertaining. The whole story line of the three devils is a well used plot device and I applaud Cates for using it effectively. 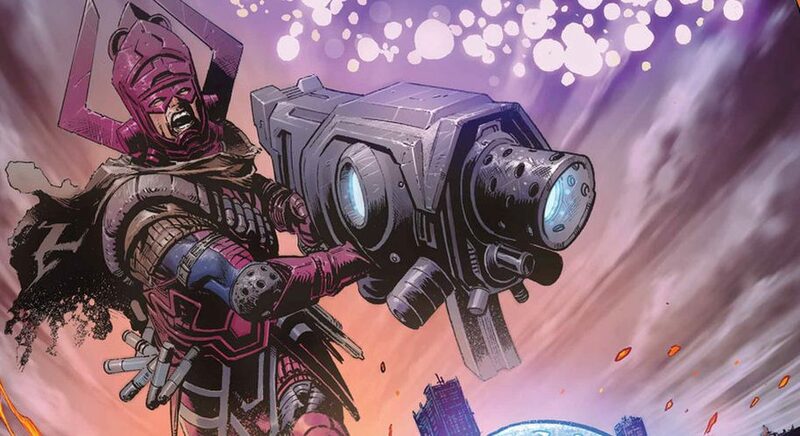 Oh, by the way, it was just announced that Cosmic Ghost Rider is getting his own mini-series this summer, so you might want to get a head start and jump on this book. Cates manages to mix Frank Castle and Ghost RIder and it works! Over before I knew it. Need more!